I'm all for multipurpose products so whether it is using lipstick as a blush or a scarf as a sarong, I like the fact that some products can double up on its uses so that we, as customers, get the most of our money spent on it. 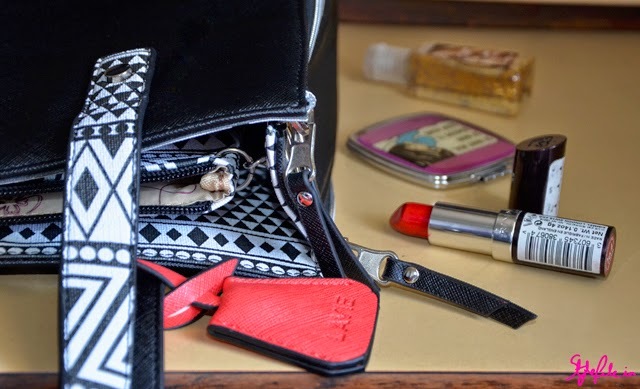 I'm certain you've viewed numerous tutorials that speak of day looks being transformed to night looks before and when it comes to the dressing part, it always ends up that you have to lug a slinky purse for your night look in your office tote when you have a party post-work. When I was in talks with Lavie for this collaboration, I was pretty intrigued because, I have never before heard of a bag that you can use not just in one or two ways, but in 4 ways! Let's take a look at this fabulous invention! The concept that the bag works on to be converted is reversible fabrics, double-sided zippers and attachable straps - something so simple and intelligent. 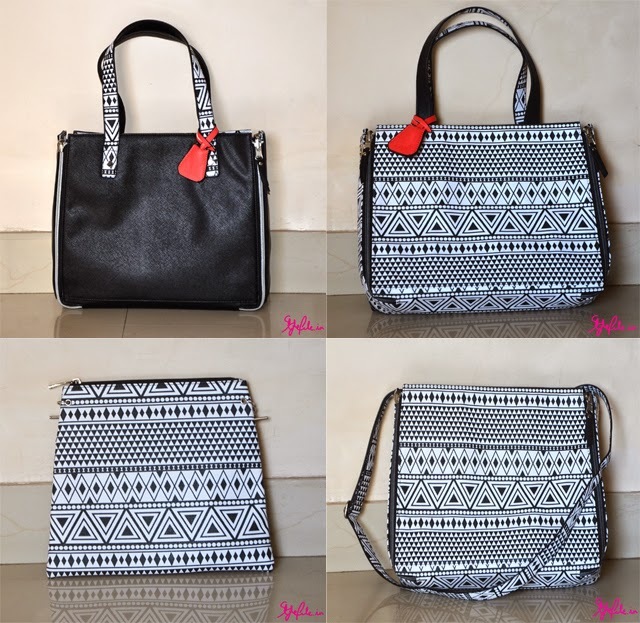 The bag I received was in black and achromatic Aztec print dual tones and as my love for Aztec prints precedes this post here, it was the perfect fit for me. My first thought on reading the instructions made me wonder if a bag that utilizes dual fabrics and zippers would end up rather clunky but with the Lavie 4D bag; not even a little. The zippers and fabrics fit in seamlessly with the design and the stitching is neat and precise. Since I like my bags big *as I carry almost a parallel universe with me like here* another doubt I had was that, with all the transforming of the bag, will there be enough space in it? And that doubt was erased completely I saw how amply spacious it is inside. 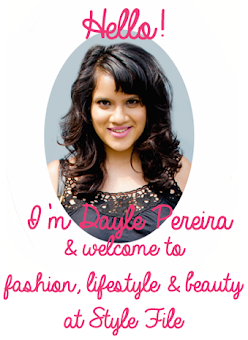 Ever so often, you know how products promise you different looks but in actuality, you look pretty much the same? The Lavie 4D bag goes out of its way and avoids that. At a retail price of Rs. 4240 for the Lavie 4D, the thought put behind this bag is immense and with small tweaks, you can barely believe it is even the same bag! While the instructions mentioned 4 different ways to wear the bag, I ingeniously came up with another 2 ways so let's take a look at the variety of ways I dramatically changed up my look with just one Lavie 4D bag. In look 1, a formal corporate look, the bag tote with Aztec accents compliments the look perfectly. In look 2 for a brunch date, the Aztec print clashes pleasantly with the polka dot print on my tank. In look 3 for class, I clipped the attachable strap to the inner links of the bag and converted it to a messenger bag which makes it handy to carry and matches the vibe of my casual look. In look 4 for a party, while the instructions recommended the pouch to be carried as a tablet case, I thought it looked pretty funky as a clutch as well and it contrasts my bright dress beautifully! From the looks and pairing you can see how versatile the print is, the ways the bag can be styled and worn and how perfect it is if you're a lady on the move! The fact that the bag is incredibly versatile and can be worn in not just 4, but more ways which is a perfect match for the everyday woman. The 4D bag by Lavie is sleek while being sturdy and strong enough to carry your goods. The stitching is neat and the finish of the bag is structured and easy to carry, whether on your shoulder or on your arm. The retail price of Rs.4240 may be seen as steep but keeping in mind that it can worn in numerous ways, it more than makes up for its price in versatility and quality. The design of the Aztec print was a perfect match for me and from my looks above, you may notice how I clashed and complimented different looks with the Aztec print, which can be paired in so many ways. I wish the bag had a magnetic clasp on the top which makes it easy to secure the bag when you travel. 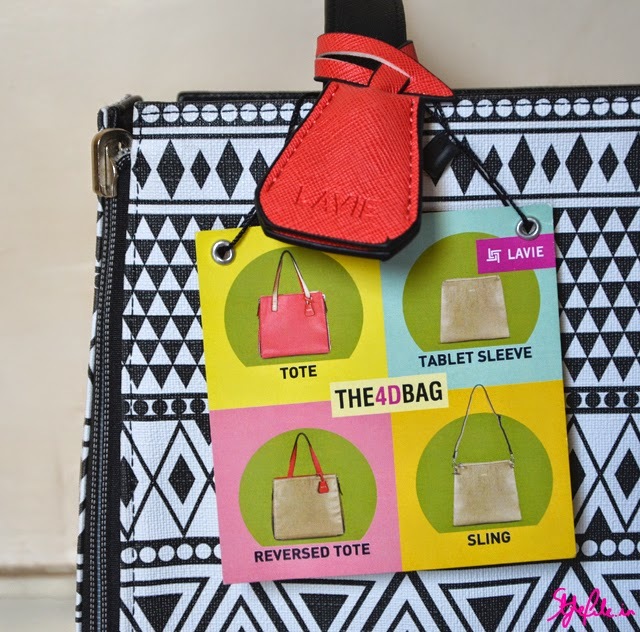 The Lavie 4D bag is one the most ingenious and stylish bags in the market today and it is one I would advise every lady today to have in her handbag collection. Disclaimer: The above post is sponsored but all the opinions mentioned are honest and completely of my own.